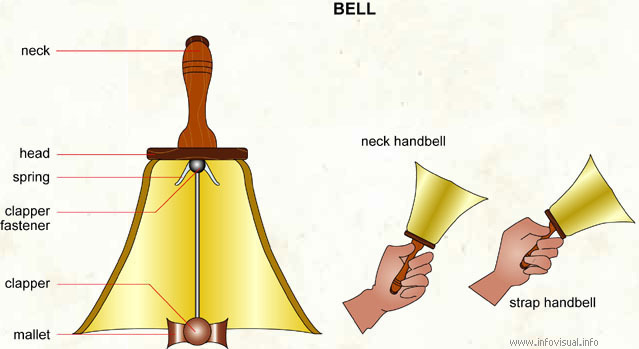 Bell - Visual Dictionary - Copyright © 2005-2016 - All rights reserved. [img]https://infovisual.info//storage/app/media/04/img_en/014 Bell.jpg[/img] [url=https://infovisual.info/en][/url] - [url=http://www.infovisual.info/]Visual Dictionary[/url] - Copyright © 2005-2016 - All rights reserved. Bell: metal percussion instrument which resonate when its edge is hit. Neck handbell: small bell with a wooden handle. Strap handbell: small bell with a leather strap. Mallet: part of the clapper that hits the bell edge. Clapper: metal piece suspended inside a bell. Clapper fastener: clapper fastening device inside a bell. Spring: returns the clapper towards the center. Head: piece to which is fastened the neck. Neck: piece that allows the bell manipulation.